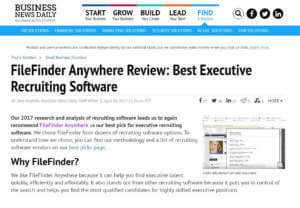 Dillistone Systems, the leading global provider of technology to executive search firms and strategic recruiting teams, is proud to announce that FileFinder Anywhere, its flagship cloud Executive Search software, has been declared “Best Executive Recruiting Software” in an independent review by global analysts BND. Prior to reaching a conclusion, BND’s researchers started with an extensive list of vendors and looked for solutions that are affordable and easy to use, and come with key features like research, analytics, reporting and automation such as importing application and résumé data into software. They also looked at mobile access, help/customer support, customization and branding options. To help inform their decisions, BND asked small business owners, hiring managers and recruitment professionals about what to look for in recruitment software, which products they recommend, and what they like or don’t like about the software they currently use or have used in the past. BND’s researchers also tested or participated in demos for all the software when possible to help evaluate ease of use. The 2017 research and analysis of recruiting software lead to again recommend FileFinder Anywhere as their best pick for executive recruiting software. BND chose FileFinder from dozens of recruiting software options because it can help its users find executive talent quickly, efficiently and affordably. To learn how FileFinder Anywhere can support your executive search business, email info@dillistone.com to book your free demonstration today. 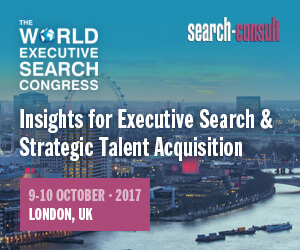 Dillistone Systems (https://www.dillistone.com) is the leading Executive Search software powering recruiters and strategic recruitment teams around the world. FileFinder Anywhere is the latest generation of FileFinder Executive Search Software, a powerful, and yet easy-to-use, combination of database, project management, web research and CRM tools. Available as a browser-based, Cloud-hosted Web app or via a variety of alternative deployment models, hundreds of search firms and corporate clients rely on FileFinder technology to better manage their executive search process. Dillistone Systems is part of Dillistone Group Plc (www.dillistonegroup.com), a global provider of software and services to recruitment firms and recruiting teams within major corporations.